It's been a busy week! I started back at work after over a year off. It's been a bit strange going back into the workforce after so long. The process has been made stranger (and also easier) because I'm working at the same place Brioni works, right next to her team. We're sharing a car and eating lunch together so it's been pretty lovely. The blocks have turned out pretty well! I only had to unpick one seam to help them line up better. They have been sewn together but I don't want to show a picture of that. 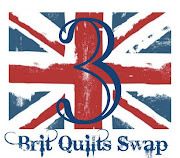 See, this is for my partner in the Brit Quilt Swap 3 and I don't want to give too much away! I will show you how the quilting is coming though! I still have a ways to go, but with any luck I'll have it pretty much done this weekend. That's not all I'm on with! I'm working on a project for an upcoming issue of Fat Quarterly and I helped Tacha with the cover for Issue 10. I'm also going to be sewing lackey for a foundation paper pieced quilt (now that I've proven my skills) that Brioni is doing for a super secret project. She's swamped with things to sew so I'm lending a hand. I want to post a few pics of what keeps me going. 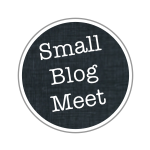 If you looked at my small blog meet post you've seen a photo of Bri, and a lot of you may have already met her. We have a lovely little boy who we're indoctrinating in the joys of fabric. We also have two lovely kitties. Jimmy is an old man at nearly 12 and Maggie is just 3. We love them to bits! One last thing I'd like to say. The comments I've received from people, especially on Flickr, has been pretty amazing. It's helped spur me along and I just want to say thanks! Those geese are fantastic, whoever gets them will be very very lucky. Thanks! Give it a go! I may be brave but I'm not that competent. This is only the second thing I've sewn. If I can do it, anyone can! You just need to take your time and assume you can do it. It'll work out fine. Can't beleive it's only the 2nd thing you have sewn, it is fantastic. Thanks! I think I've done so well because as a joiner I'm used to working with my hands and power tools and doing fiddly little things. Patchwork and sewing isn't much different really. I've found it just takes time and patience. Oh, and a few tips from the live in quilting guru has certainly helped! It looks incredible! I love how you are setting them. Can't wait for more photos. Thanks Erica! You'll have to wait until I can get the hang of sewing binding on though... I'm finding it tricky.